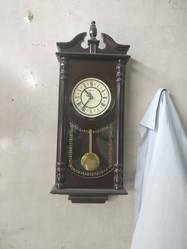 Antique roman wall clock with a pendulum swing and carving, carved from wood. We are passionately engaged in trading an exclusive array of Wooden Pendulum Designer Glass Clock. We offer Ivory Wood Pendulum Wall Clock. Owing to our expertise in the domain we are able to bring forth this exquisite Clock with Pandulum ange to our customers. Customers can chose from a comprehensive variety of designs, shapes and sizes as per the occasion. Manufactured using quality metal and wood pieces, this range is appreciated for the rust proof sheen that lasts for a life time. The dial can put on the customers’ requirement; we also can design the dial as customers' requirements. Many customers cooperate with our company for the reasonable price, high quality and good service of our wall clock. These pendulum wall clocks are crafted in accordance with the latest trend that suits the desired specification of our clients. Its shimmering looks capture the attention of various clients. These pendulum wall clocks are available in variety of shapes, sizes and colors, for the discerning buyers.